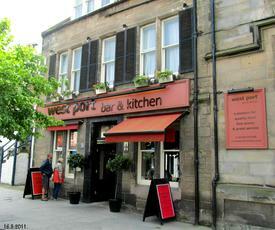 Came by the Westport on a short trip up in Scotland, had dinner which was well tasty (amazing chips!) and found that there were rooms avaliable too. We stayed totally on a whim at last minuite, the guys couldn't have been more helpfull. We only found out what a find the place was after our first night when we were looking for other hotels about the place, for the price and what you get for it - there's no where better in St Andrews! You guys are so last year. This place has since changed hands & many changes have happened. Out has gone all the cold white & steel, in has come colour, warmth & great food. It will now appeal to a more mature market and not over-run by the Yah-students. It reminds me of what it was like in the late 90's, but better: better food, better spaces, better staff & better prices too !!! And if your travelling up to St Andrews they also have rooms to stay in as well. 10 out of 10 from me. This place was best back before it became the Westport. In 1991, it was still called the Britannia and was run by a dear old lady who served warm bottles of MacEwans Export to gents and soft drinks to the lassies. Such a shame that she was ousted and the place changed to woo a "trendier" clientele.